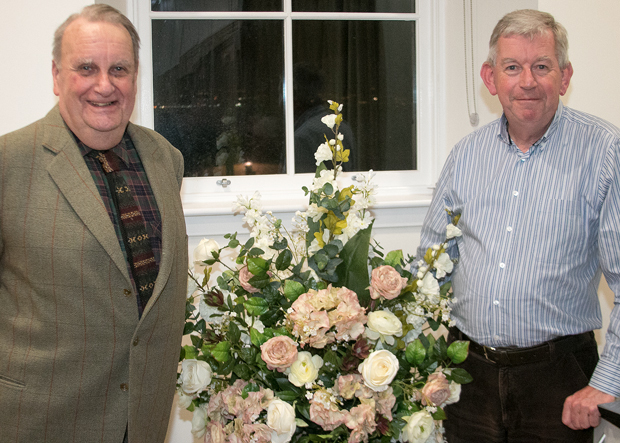 Bill, whose late aunt Nance Anderson MBE JP bequeathed the paintings which were the basis of the collection, travelled from his Bridge of Allan home with his wife Sheila and son Robin, and was welcomed by Heritage Trust chairman the Rev David Clark. Nance, Annie Templeton Anderson, of Inistore, James Street, passed away at the Barclay Smith Home in Colquhoun Street on January 13 1980 at the age of 90. She was the daughter of silk throwster William Anderson, Provost of Helensburgh from 1898-1902, and Annie Templeton, of the Templeton carpets family, and was born at Dalfruin, Helensburgh, on November 9 1889. She had two sisters, Mary and Frank, and two brothers, John and Kenneth. The family moved to Inistore, a William Leiper-designed house then at 76 John Street, which was later renamed Glen Kin. She and her brothers and sisters donated the Templeton family home Drumgarve, a block lower and on the other side of John Street, to the town in 1946 to become the Templeton Library, and it opened to the public in 1950. It eventually closed in 1998. When her parents died in 1928 she and her brother John moved to 58 James Street, which she renamed Inistore. She is reputed to have been the first person in the town to instal a gas central heating system there. She was educated at St Bride’s School, and after reading geography at Oxford University for two years — before the days when women were allowed to take degrees — and after Froebel teacher training at Bedford she returned to teach at St Bride’s for a time. 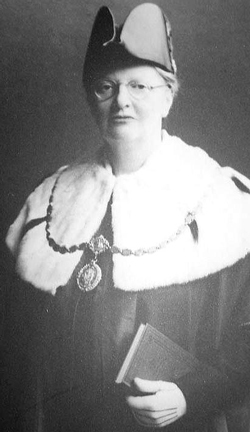 She was active in many town clubs and societies, and served on the former Helensburgh Town Council. Co-opted to membership in 1939, she was made the first woman Bailie three years later. She retired from the council in 1945, but was elected on to it again the following year. She was chairman of the library committee from 1950, the year she retired from the council, until 1967 and represented the council on the Vale of Leven Hospital Board at the time it was built. Nance was a leading figure in the local Woman’s Voluntary Service for Civil Defence, becoming a centre leader in charge of the local branch in 1939. She drove a large WVS mobile canteen into the Clydebank area during the 1941 blitz, taking light meals to bombed out people and to the Civil Defence services. At the height of the blitz she visited many shelters and helped to keep up the spirits of the people by starting community singing and by entertaining them with her skill as a whistler. Later that year she received the MBE for services to the WVS. She was the founder, first producer and president of Helensburgh Amateur Dramatic Society in the 1920s and 30s, and her casts included poets W.H.Auden — whom, Bill said, she taught to waltz — and C.Day Lewis. She served as honorary president of Helensburgh Art Club and had one of the finest collections of paintings of old Helensburgh, including some by the famous Glasgow Boys. She also had a particular interest in maps. She was a staunch member of St Columba Parish Church, which she joined in 1907. In addition to presenting the town with the Templeton Library, Miss Anderson also donated the houses surrounding it, the Anderson Trust houses at Drumgarve Court set up for single or widowed ladies from the town. After her death Bill and his brother found two handwritten notes stating that she wanted her picture collection to be given to the town, and although this was not in her will, they decided to do this. They set up the Anderson Trust Local Collection in 1981, and, to raise finance to meet costs, the companion Inistore Trust, both of which exist today. From an initial 34 pictures the collection has expanded to 117 works of art. There is an annual exhibition of works in Helensburgh Library on West King Street each January to June, and the latest — on the theme of buildings — was hung on Saturday and is now open. Bill’s talk was punctuated by images of many paintings and etchings in the collection, including works by Sir James Guthrie, J.Whitelaw Hamilton, A.N. and Maggie Paterson, Viola Paterson, James Kay, Norah Neilson Gray, Caroline Sillars, and two of Nance’s closest friends, Gregor Ian Smith and Ailsa Tanner. Bill (left) is pictured with Mr Clark, who proposed the vote of thanks.